Perhaps the most important, and counter-intuitive, insight in international economics was made by 19th century classical economist David Ricardo, who formulated the theory of comparative advantage. This gain would be a result of exporting the goods which the domestic country could produce at a comparatively lower opportunity cost and import the goods in which it had a comparatively higher opportunity cost. Thus, the efficiency gains from trade should boost consumption and welfare for all countries engaged in trade. There is a considerable amount of evidence that trade and economic integration with the world fosters economic efficiency and development. Figure 1 demonstrates the relationship between changes in the natural log of the trade share of GDP (x-axis) and the natural log of Gross Domestic Product (GDP) per capita (y-axis). 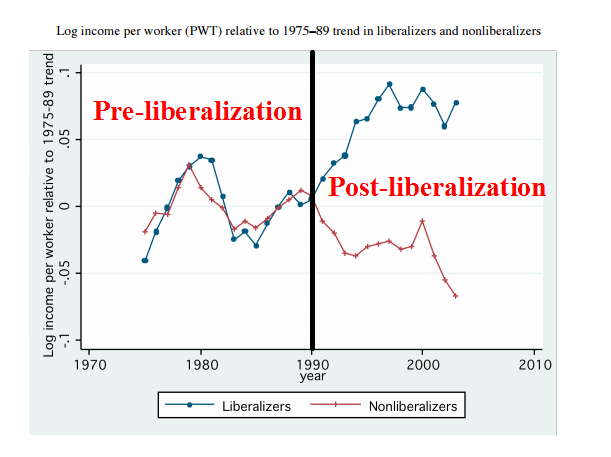 In a rigorous study published by the National Bureau of Economic Research, Feyrer (2009) used the exogenous variation in trade generated by the 1967 to 1975 Closing of the Suez Canal, which facilitates around 7.5% of world trade, as a natural experiment to identify the causal effects of trade on income per capita. 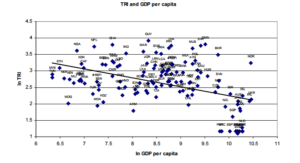 He found that the elasticity of income per capita with respect to trade’s share of GDP was approximately 0.25. In other words, a 1 percentage point increase in trade’s share of GDP lead to a 0.25 increase in income per person, a significant effect. The fact that participating in more international trade results in more economic growth implies but does not necessarily prove that reducing barriers to trade (i.e reforms towards free trade) will lead to more rapid economic development. 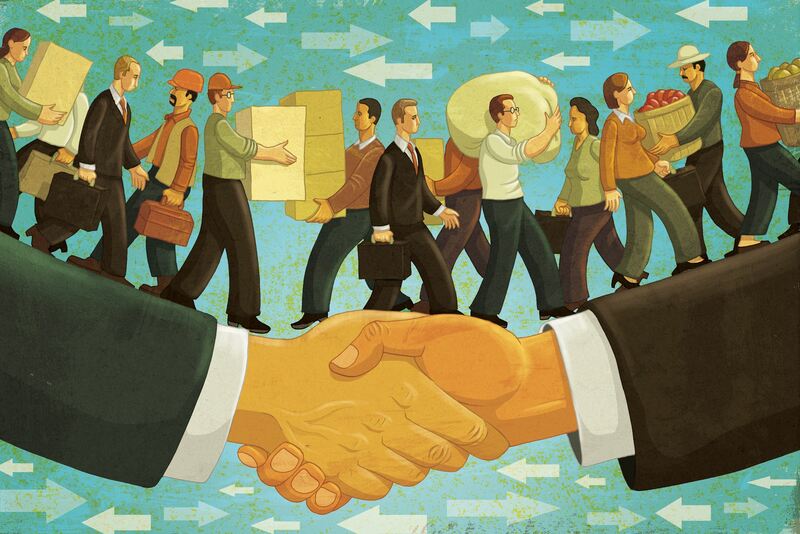 Thankfully, a number of economists have attempted to tackle the empirical question of whether or not free trade actually results in more economic growth or a higher level of economic development. 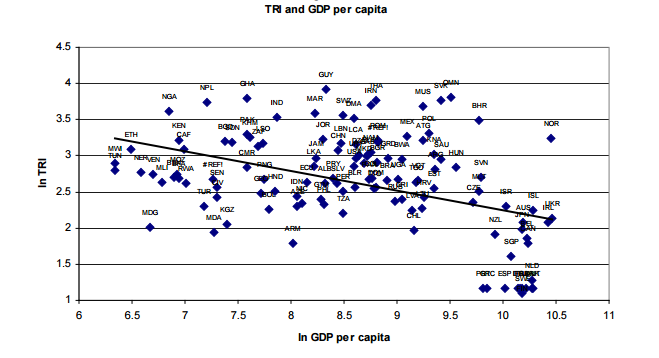 For example, Vlad Manole and Mariana Spatareanu found, as shown in Figure 2, that there is a significantly negative relationship between the level of trade protection (i.e tariffs, quotas, and other trade barriers) of a country (on the y-axis) and its income per person (GDP per capita) on the x-axis. Probably the most famous study on this matter was produced by Roman Wacziarg and Karen Horn Welch. 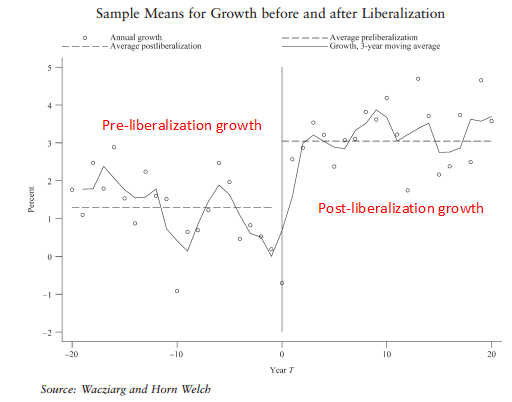 Using quantitative analysis and a thorough review of country-specific case studies of free trade reforms, Wacziarg and Welch found that after countries reformed their trade policies in favor of freer trade, average investment and economic growth surged quite dramatically. Gonzalo Salinas of Oxford University and Ataman Aksoy of the World Bank conducted a similar exercise to Wacziarg and Welch, but used a slightly different methodology (which they felt was superior) and also constructed counter-factuals to compare how economic growth might have evolved had the countries examined never reformed their economies. 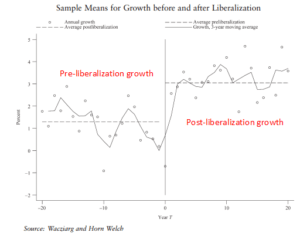 Prior to the reforms, the non-reforming and reforming countries had similar trends in economic growth. 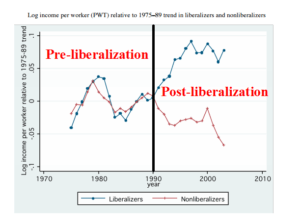 However, as shown in Figure 4, once the reformers started cutting their tariff rates around 1990, their growth accelerated while the economies of non-reformers stagnated. The gains from free trade additionally accrue to us in the form of expanded product variety. While Bernie Sanders would seem to think this is a bad thing, most Americans don’t. In fact, Seminal research by Christian Broda of the University of Chicago and David E. Weinstein of Colombia University, found that the variety of imported goods increased three-fold from 1972 to 2001. The value to American consumers of this import induced expanded product variety is estimated to be equivalent to 2.6 percent of national income, about $450 billion as of 2014. That’s not exactly small change. Certainly, some people are harmed by foreign competition induced by free trade. The costs of free trade are concentrated and extremely visible. When a manufacturing company goes out of business as a result of foreign competition, it’s hard not to notice. 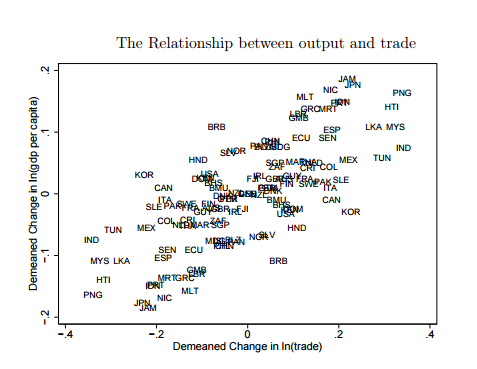 The benefits of free trade, on the other hand, are widely dispersed and not as visible. They come in the form of consumer prices which are considerably lower than they otherwise would be and a larger economy. 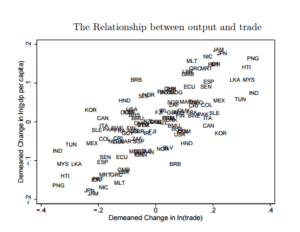 Almost certainly, the large benefits of free trade outweigh the costs.